There are 4 Memory Care Facilities in the Brooksville area, with 1 in Brooksville and 3 nearby. The average cost of memory care in Brooksville is $2,125 per month. This is lower than the national median of $4,650. Caring.com has helped 6 families in Brooksville find high-quality senior care. To speak with one of our Family Advisors about memory care options and costs in Brooksville, call (855) 863-8283. The population of Brooksville is 8,147, and 27.5 percent of those residents are 65 or older. Brooksville is the county seat of Nassau County, and it's estimated by Elder Affairs that Nassau County has 1,976 residents who probably have Alzheimer's disease, dementia or some other type of cognitive disorder. Across the state, some 540,000 seniors have memory impairments, and that figure is expected to increase by 30 percent by 2025. It's likely that Brooksville's numbers will jump also. In the immediate area are 11 memory care facilities, including one in Brooksville and 10 in Spring Hill, New Port Richey other nearby communities. An extended congregate care license (ECC) from the state is required prior to operating a memory care facility. Florida's favorable tax policy excludes personal income, making the Sunshine State popular among retirees. For many families, the absence of income tax provides additional funds to be used for memory care and other critical services in Brooksville. Cost of living indices are based on a U.S. average of 100. Brooksville's cost of living is 86.6, so it's less expensive to live there than in other cities in the country. That lower expense reduces the price of healthcare for seniors. This helps stretch their retirement pensions and Social Security payments, which can add to the available money for memory care. The temperature on this island has a relatively narrow range with winter lows of 46 and summer highs reaching 91. Sunny days in Brooksville outnumber the U.S. yearly average by 240 to 205. Brooksville rated a 79 out of 100 for its Sperling's Comfort Index, which is well above the national average. Brooksville violent crime index is 69.5, so its more than twice the U.S. average of 31.1. The property crime index is 55.5, which is about 17 points higher than the national average. Seniors in memory care facilities have an extra layer of security in locked buildings. Memory Care costs in Brooksville start around $2,125 per month on average, while the nationwide average cost of memory care is $4,798 per month. It’s important to note that memory care rates in Brooksville and the surrounding suburbs can vary widely based on factors such as location, the level of care needed, apartment size and the types of amenities offered at each community. Brooksville and the surrounding area are home to numerous government agencies and non-profit organizations offering help for seniors searching for or currently residing in an assisted living community. These organizations can also provide assistance in a number of other eldercare services such as geriatric care management, elder law advice, estate planning, finding home care and health and wellness programs. To see a list of free memory care resources in Brooksville, please visit our Assisted Living in Florida page. 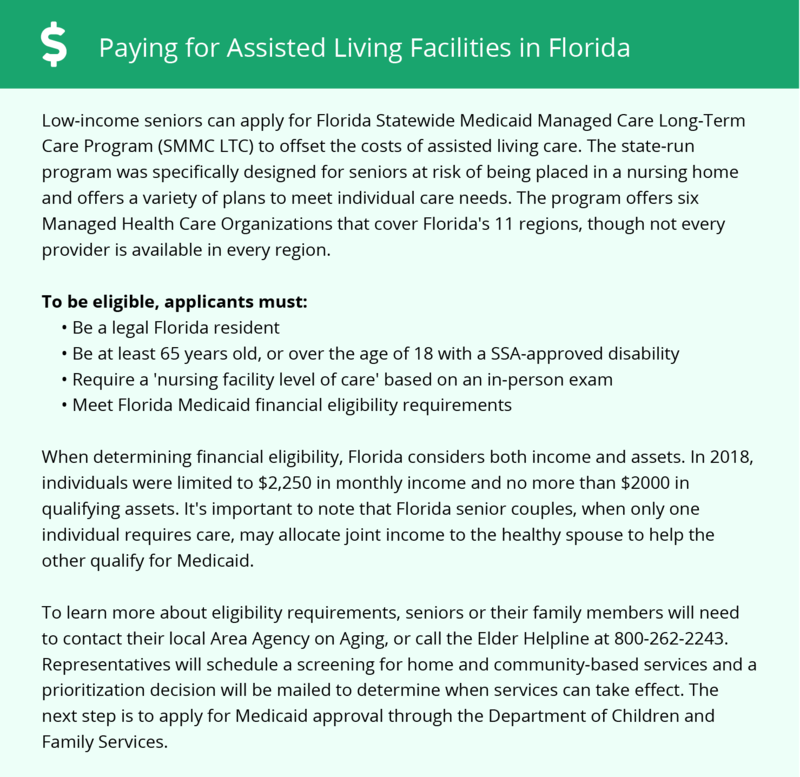 Brooksville-area assisted living communities must adhere to the comprehensive set of state laws and regulations that all assisted living communities in Florida are required to follow. Visit our Memory Care in Florida page for more information about these laws.